In an attempt to try and stop myself gravitating towards the same few things in my make up collection I've decided to try something new. I'm going to pick out a few things each month that I either haven't been reaching for or that are new, and try to use them every day. At the end of each month I can then part with them if they don't work for me or keep hold of them to keep on using if I love them. This has been in my collection for a really long time (probably longer than it should have been) and I loved it but stopped using it for some reason. I like that the four shades are large enough to use individually, with the light pink shade being my favourite and I can't really believe this found its way to the back of my blush drawer for so long. For Christmas I received one of the Soap & Glory gift sets and this mascara was one of the things inside. I'm not really sure what I was expecting, but I definitely wasn't expecting to love it and I really do. It gives me very natural looking fluttery lashes that don't look clumpy or have that horrible crispy feeling. I received this in my January Birchbox* and I've been curious about this cult gloss formula for a while so I couldn't resist trying it straight away. So...I don't get it. It's insanely sticky & there's not really any colour, just a lot of glitter. The packaging is great though, I like the clicky up tube and you can see exactly how much is left in there. I have to say I'm pretty disappointed, I thought it was going to be amazing. I'd love to know which products are in your make up bag right now! What a great idea. I had an idea for a similar monthly post, to try and get me to change up my makeup more as I'm terrible at doing that!! I have been told to try the Soap & Glory mascara but I don't like the look of the brush. I also love the look of the Collection blush quad. They look so pretty and I want to try the shimmer blush thing from Collection as they look amazing. i always adore your photography so much, i wish mine compared! I absolutely love the Thick & Fast mascara too! I've recently lost mine so I really need to pick up a replacement. I've been using the Thick and Fast for years. I got my first one in one of the Soap and Glory gift sets and I haven't used another mascara since. Also, when you buy the full size one (in the gift sets they're smaller) they last for ages! I love S&G Thick and Fast! I've been using it since I got it in a Christmas box a few years ago (obviously not same specific tube!!) but I love it. I've been using my ELF brow kit a lot recently too. I need to start doing this. I have a whole bag of bits but only ever pull out the same products. I love Soap & Glory but don't personally find the mascara really works for me. I'm still on the hunt for my perfect mascara! I agree with you so much about the stila lipgloss! I remember using them when I was younger, YEARS ago before others could really compete. I think the love for this product is just a bit outdated. This is a fun feature that I'm looking forward to you continuing! I'm in the process of witting down my makeup bag and I'm trying to have just a few, good quality products that I use consistently. Also, interesting review of the Stila Lip Glaze! I personally don't really like too sparkly lips, plus the way you described it as so sticky ... it just sounds awful. Thanks for the tip! I'm another fan of Thick & Fast! I think the packaging is deceptive! I really wish I had picked up that Soap & Glory giftset for myself this Christmas. I got the Jack Wills one (which I love!) but I really want to try that mascara! 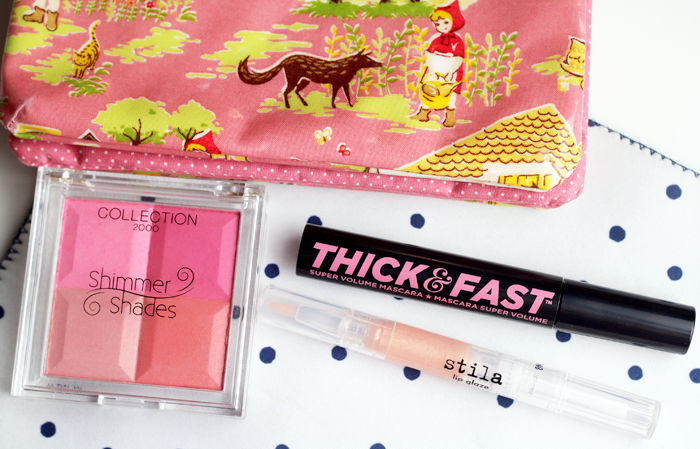 Your make up bag is gorgeous by the way! I adore Thick & Fast, best mascara I've ever used! What a shame about the Stila lip glaze, I've heard really good things about them as well. How bizarre. I've actually seen that Shimmer Shades Blushalicious Blusher around, but never thought to try it. You make me wonder if I should try it…! I am in need of a new mascara and I might give this one a try, although I really really love Maybelline's The Rocket. Right now in my makeup bag I have one too many black eyeliners. They just made their way in my makeup bag and I can't seem to part with any of them. That blush quad looks very nice. Lately I'm trying to finalize a bronzer really old, I have it for years and now I just want to finish it at last.